This species is accepted, and its native range is N. & Central America, Hispaniola, Venezuela to S. South America. Nativa en Colombia; Alt. 1500 - 4500 m.; Andes, Sierra Nevada de Santa Marta. Perennial; caespitose. Culms decumbent; weak; 50-100 cm long; 0.7-1 mm diam. Lateral branches lacking. Leaves cauline. Leaf-sheaths ribbed; smooth; glabrous on surface. Ligule an eciliate membrane; 2-5 mm long; lacerate. Leaf-blades 6-13 cm long; 1.5-3 mm wide. Leaf-blade surface ribbed; scaberulous. Inflorescence a panicle. Peduncle 8-15 cm long. Panicle open; ovate; effuse; 11-15 cm long; 6-11 cm wide. Primary panicle branches 3-7 -nate; whorled at most nodes. Panicle branches flexuous. Spikelets spreading; solitary. Fertile spikelets pedicelled. Spikelets comprising 1 fertile florets; without rhachilla extension. Spikelets oblong; laterally compressed; 2.2-2.9 mm long; breaking up at maturity; disarticulating below each fertile floret. Floret callus glabrous. 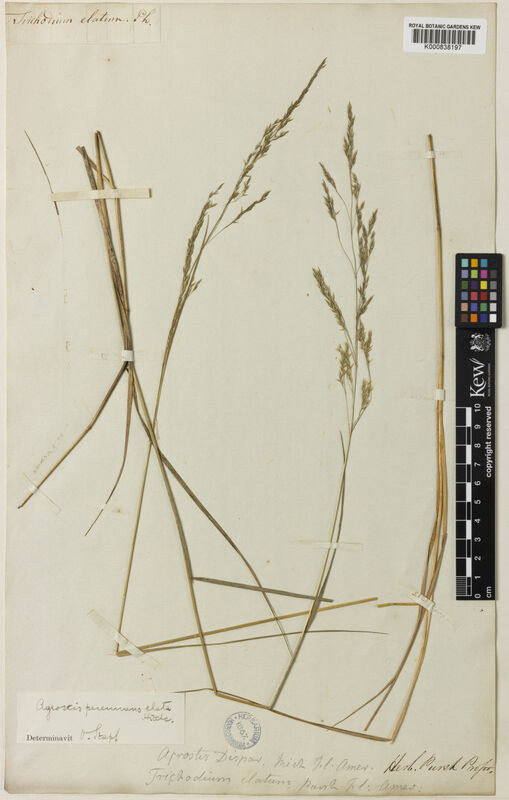 Glumes persistent; similar; exceeding apex of florets; firmer than fertile lemma; shiny; gaping. Lower glume oblong; 2.2-2.9 mm long; 1.1-1.2 length of upper glume; membranous; 1-keeled; 1 -veined. Lower glume primary vein scabrous. Lower glume lateral veins absent. Lower glume apex caudate. Upper glume oblong; 1.9-2.3 mm long; 1.1-1.3 length of adjacent fertile lemma; membranous; 1-keeled; 1 -veined. Upper glume primary vein scabrous. Upper glume lateral veins absent. Upper glume apex caudate. Fertile lemma ovate; 1.7-1.8 mm long; hyaline; without keel; 5 -veined. Lemma lateral veins obscure; extending close to apex. Lemma apex erose; truncate; muticous. Palea absent or minute. Lodicules 2; membranous. Anthers 3; 0.8-1 mm long; purple. Africa: western Indian ocean. North America: eastern Canada, north-central USA, northeast USA, south-central USA, southeast USA, and Mexico. South America: Mesoamericana, Caribbean, northern South America, western South America, and southern South America. Agrostis altissima var. laxa Tuck. Agrostis canina subsp. grandiflora Hack. 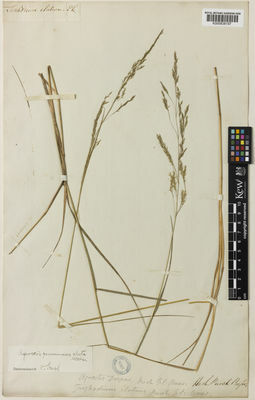 Agrostis exarata var. angustifolia Hack. 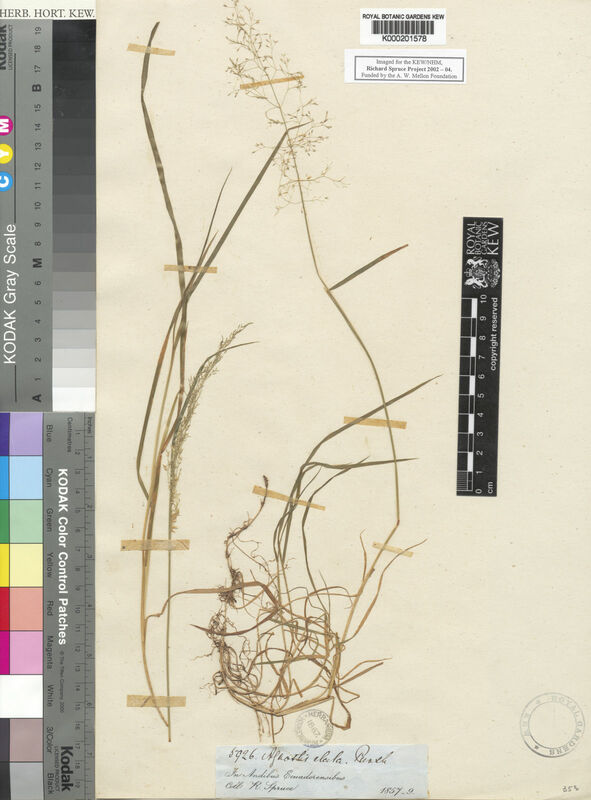 Agrostis fasciculata (Kunth) Roem. & Schult. Agrostis perennans var. elata (Pursh) Hitchc. Agrostis perennans var. humilis Farw. Agrostis tenuifolia var. fretensis Hook.f. Trichodium affine Willd. ex Steud. Trichodium noveboracense (Spreng.) Schult. & Schult.f.